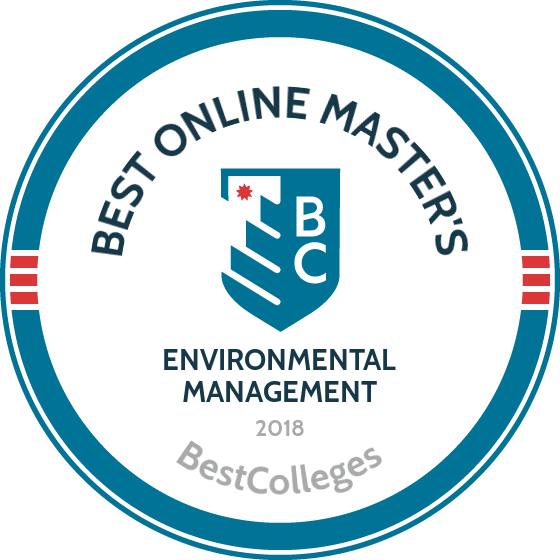 What Are The Best Online Master's in Environmental Management Programs? What Else Can I Expect From an Online Master's in Environmental Management Program? An online environmental management degree prepares graduates for high-level management positions within industrial, commercial, governmental, and military organizations. Students learn to craft solutions to local and global environmental challenges, such as pollution prevention and waste management, while gaining the confidence to lead. According to the Bureau of Labor Statistics, environmental scientists and specialists will see a job growth of 11% over the next seven years, which makes this the ideal time to begin a career in environmental management. Duke has become a leader in environmental education, and the North Carolina school’s innovative online environmental management degree continues its traditions of excellence. The two-year program is aimed at mid-career professionals and emphasizes both leadership and stewardship. It borrows the “place and space” concept from the university’s renowned online business program -- students do most of their work in “space” (virtual classrooms), but they also must travel to a “place” and complete five intensive residencies. In this case, the place might be Durham, North Carolina or Washington, DC. The 30-credit curriculum of the school's master of environmental management program combines individual and team-based coursework. Students use web conferencing technology to meet in online classrooms once a week for 60 or 90 minutes, and do the rest of their work asynchronously. Classes rely on discussion much more than lecture and participants are required to attend. Requisites include a professional writing course, an orientation at the Durham campus, an environmental-leadership module in Washington, DC, and a master’s project based on the student’s work background. Applicants must hold an undergraduate degree and must have five years of relevant professional experience. One of the big advantages of the University of Wisconsin’s master of science in sustainable management program is that it can be pursued on your schedule. Unlike many similar programs, UW’s 34-credit curriculum doesn’t require any residencies, and learners can complete all coursework via the web, 24/7. Designed for working professionals, the school designed the program around 12 classes, and it explores the latest in leadership theory, and the relationship between nature, society, and the economy. Students pursuing UW’s environmental management master's degree online program complete eight required courses and take two "specialty" classes they use to focus their studies in their area of interest. A pair of electives rounds out the curriculum. In addition to topics like corporate social responsibility, sustainable design, and supply chain management, participants study effective written and oral communication, positioning themselves for jobs at the executive level. Applicants must have an undergraduate degree, and a 3.0 GPA or better from an accredited university. Online students pay the same tuition as Wisconsin residents. The University of Illinois at Urbana-Champaign features a try-before-you-buy policy for its environmental management master's degree online program; prospective students can take 12 credits before they’re admitted to the program. Not only does this allow potential participants to make sure the fit is right for them, it also makes them strong candidates for admission, and gives them a solid start toward their degree. The university has offered long distance master’s of science degrees since 1999 and online for the better part of a decade. Students complete the school's master of science in natural resources and environmental sciences 32-credit curriculum largely online, but they are required to make a trip to Urbana-Champaign to take their final exam and present their special project. Most courses include real-time meetings, where participants interact with their professors and peers, and some feature optional field trips or labs. Both thesis and non-thesis tracks are available, and students must maintain a 3.0 or better GPA. The program typically takes students two years to complete. The master of arts in environmental studies degree at UIS is a 40-credit program that students can customize to feature a focus on environmental planning and management. Offered by the school’s prestigious Department of Environmental Studies, the program is available entirely online. The planning and management concentration places a strong emphasis on natural resources policy, geographic information systems, and problems and planning. The program strongly focuses on professional development. Students must complete 12 core credits, 24 credits in their chosen specialty field, and a four-credit "closure exercise." The closure is essentially a capstone project that demonstrates mastery of a chosen concentration and features a strong writing component. Some credits may be earned through an approved internship. Students must maintain a 3.0 GPA throughout the program. Applicants must first be admitted to UIS and then to the Department of Environmental Studies. Online students must receive the approval of a faculty advisor prior to admission. Webster has offered online degrees for more than 15 years and now hosts over two dozen graduate-level programs in its WorldClassRoom, including a master of science in environmental management. The university’s 36-credit curriculum delves into the business aspects of ecological stewardship, taking participants through the legal, ethical, and financial impacts of environmental decision making. Students can select a concentration in sustainability (or add an additional 20 credits and graduate with an MBA with an emphasis in environmental management). The school requires no visits to its St. Louis campus. Webster’s environmental management master's degree online program delivers its coursework asynchronously and follows the traditional semester schedule. Time to complete depends on full-time or part-time status. Those enrolled in the sustainability concentration must take one additional class. Applicants must possess at least bachelor’s degree and have completed an applied statistics course. Tuition for online learners is slightly higher than tuition for on-campus students. A hybrid program, the University of Houston-Clear Lake's master of science in environmental management program may complete about 80% online but several classes require a residency in the nation’s fourth-largest city. UHCL developed the 36-credit curriculum with input from government, corporations, the scientific community, and environmental non-profits, and it explores the nexus of industry and ecology. Graduates leave with a solid foundation in the legal and business context in which environmental decisions are made -- and the leadership skills to land management positions. Students use electives in fields like risk management, sustainability, water use, coastal ecology, and geographic information systems to tailor their studies to their area of interest. The program typically takes 24 to 30 months to complete. Applicants are usually working professionals and must hold a bachelor’s degree and a minimum 3.0 GPA in their last 60 credits. They must also have earned at least 34 undergraduate credits in the natural sciences, six credits in math, and a score of 290 or better on the GRE. Arizona State’s environmental management master's degree offers students a lot of options. They can take the class online, on-campus, or as a hybrid, where they select from three different tracks, and can elect to do a thesis, an applied project, or coursework alone. No matter what a student chooses, they work with experienced, professional peers from across the world. ASU’s master of science in environmental and resource management program follows a 30-credit curriculum divided into four parts: nine credits in core courses, nine credits in their focus area, two or three classes of electives, and a culminating experience. Concentration options include environmental management, international management and sustainable development, and water management. Applicants must have earned a baccalaureate degree, a minimum 3.0 GPA for their last 60 credit hours, and acceptable GRE scores (though the GRE can be waived with approved work experience). Out-of-state students pay the same tuition rate as Arizona residents. ASU Online offers six start dates per year. The University of Maryland’s University College specializes in providing educational opportunities for working professionals, and that’s exactly who the Adelphi school’s environmental management program is designed for. The school recommends experience in an environmental field for the 36-credit program, and it also helps to have taken college biology or chemistry. Students can pursue UMUC’s master of science in environmental management entirely online (the school also offers a hybrid option). The curriculum combines top-level business management skills with a focus on environmental sensitivity, pollution prevention, and waste management. UMUC’s online classrooms are open all day, every day, and while professors assign homework that’s due weekly or biweekly, the program does not require students to log in at any particular time. UMUC's curriculum follows an accelerated eight-week schedule that allows participants to take fewer classes at a time and still finish within the five years required. Students must maintain a minimum 3.0 GPA. The school provides graduate students with textbooks and course materials. Students may transfer in up to six credits. It’s no surprise that Green Mountain has an outstanding graduate program in environmental management -- the Poultney, Vermont, institution is one of the nation’s preeminent environmental schools and has focused on natural resources and sustainability for two decades. Learners can earn most of GMC’s graduate degrees online, including the school's master of science in environmental studies, but the program does require some local fieldwork. Students choose a concentration in conservation biology, communication, or a self-designed subject, and gain expertise in their own local bioregion. Program participants typically complete a single six-week course at a time and move through the curriculum sequentially, completing core requirements before electives. The program is cohort-based and most classes have less than 18 students. Classes are taught asynchronously. The school has one optional residency per year. GMC has a rolling admissions policy, and graduate studies can begin in the spring or fall. Applicants must submit college transcripts, a current resume, three letters of recommendation, and an essay detailing why they wish to attend. Students in Prescott College’s online master of arts in environmental studies and sustainability program can shape their degree in a way that fits their career path. The Arizona institution is renowned for self-directed learning and that tradition continues with its limited residency, web-based graduate programs. The school constructs its 36-credit curriculum around online classes, mentored learning, and field study, and students create their own paths based on their personal goals and passions. Several alumni have used their MA in environmental studies to pursue a career in environmental management. Whichever way students choose to go, they’re required to attend an initial orientation and colloquiums each semester at the school’s campus in Prescott, Arizona. Most coursework is asynchronous though some requires real-time collaboration. Prescott takes a holistic approach to admission, looking at more than just grades and academic experience. Applicants must submit a current resume, educational transcripts, two letters of recommendation, and a personal essay. Online learners pay nearly 20% less than on-campus students for tuition. Some environmental management graduate programs are self-directed with asynchronous classes; students watch recorded videos and lectures on their own time. Other programs implement cohort-based or instructor-guided options, with synchronous classes that include real-time web conferencing. Environmental management master's degree online programs offer varying curricula, but a few courses most programs require are listed below. Environmental law and policy: By providing legislative, executive, and judicial perspectives, this course examines the development, implementation, and enforcement of leading environmental and energy law and policy. Students discuss the historical and modern impact of U.S. federal, state, and local governments on the environment. Economics of environmental management: This course applies natural resource economics to understand and address environmental challenges, such as climate change, global warming, and biodiversity conservation. Students explore cost-benefit and microeconomic analyses, as well as economic incentives as applied to environmental management. Water resources management: This course examines modern water resource planning, distribution, management, and policy-making at local and global levels. Students explore challenges associated with quality, quantity, and governance of water resources, and discuss aquatic ecosystems, flooding, water scarcity, health, climate change, energy, and new technologies. Ecosystem science: Coursework examines ecological patterns and processes, biodiversity, food web interactions, temporal and spatial boundaries, species-area relationships, and whole-system metabolism. Students learn to develop ecosystem management plans to manage and conserve species, populations, communities, and people. HOW LONG DOES IT TAKE TO GET AN ONLINE MASTER'S IN ENVIRONMENTAL MANAGEMENT? Most students complete their online master's degree in environmental management in two or three years, and most schools require students to complete the program within five or six years. But both the number of required credits and the student's enrollment status impact completion time. Most master's degree in environmental management programs comprise 36 credits, however requirements can range from 30 to 48 credits. Some programs are designed for part-time learners, while others are offered only full time. Program format also affects the time required to earn the degree. Self-motivated learners who prefer to study independently benefit from an individually paced program, in which coursework is delivered asynchronously without set class times. Distance students who prefer to learn directly from instructors, while studying alongside other students, enjoy cohort-based programs that offer synchronous classes with real-time video conferencing. Accreditation is a review process that enables higher education institutions and programs to demonstrate their willingness and ability to meet certain standards. There are two types of educational accreditation: institutional and specialized. Institutional accreditation applies to an entire school, while specialized accreditation applies to a specific department or program. Accreditation shows dedication and commitment to meeting and exceeding educational standards. Regional accreditation, in particular, is widely recognized by institutions and employers, and a degree from an accredited school is highly regarded. To be nationally or regionally recognized, a school, department, or program must undergo periodic review by an accrediting agency such as the U.S. Council for Higher Education Accreditation (CHEA), an organization comprising more than 7,600 colleges, universities, and accrediting agencies. The U.S. Department of Education publishes a list of accrediting agencies and accredited schools. Graduates of environmental management master's degree online programs work to influence environmental ethics, health and safety, renewable energies, and environmental policy. With the industry-specific technological knowledge and practical management experience gained during their studies, environmental management graduates pursue careers in environment science, safety and policy analysis, risk and sustainability management, and compliance and regulation. Environmental specialists protect the environment and human health by cleaning polluted areas, working with industry leaders to reduce waste, and advising policymakers on industry-specific factors and issues. They monitor sources of pollution and contamination, investigate environmental violations, and educate others on environmental risks. Environmental engineers develop solutions to problems concerning water and air pollution, climate change, environmental sustainability, waste disposal, and ozone depletion. They conduct hazardous-waste management studies, design municipal and industrial water supplies and wastewater treatment systems, and advise policymakers on environmental sustainability. Agricultural scientists research methods to improve the efficiency and safety of agriculture by analyzing and assuring the quality of products and facilities. They work in laboratories, processing plants, farms, and greenhouses in such industries as research and development, manufacturing, and higher education. Conservation foresters work on privately owned land or in governments to improve, protect, and safeguard natural resources. They focus on controlling erosion, land regeneration, soil quality, and tree harvesting to manage the quality of forests, parks, ranches, and rangelands. Hydrologists analyze data to determine how water impacts the environment. They work closely with environmental scientists and engineers to manage and solve problems associated with water conversation, supply, quality, and availability. They may also work with atmospheric scientists to study the effects of precipitation and climate on the environment. An online master's degree in environmental management helps graduates stand out when searching for employment. Rather than beginning in an entry-level position, master's degree-holders often move straight to higher-ranking positions. Those with project management skills tend to earn higher salaries. While geographic location also affects income, the following table shows the average salaries of environmental management graduates across their careers. Most schools offer loans, grants, scholarships and work-study programs to help students finance their online environmental management master's degree. To receive federal aid, students must complete the Free Application for Federal Student Aid (FAFSA). Merit-based scholarships are available through professional organizations such as the National Science Foundation and the U.S. Department of Energy.